NEWPORT, Ky. — It’s just not summer without sharks! Newport Aquarium, the Shark Capital of the Midwest, is kicking off the summer season and Memorial Day weekend with free kid’s admission and a fintastic event celebrating sharks! During #SharkSummer, May 27 to July 8, guests will get the opportunity to journey through the aquarium, discovering fun shark facts and shark related exhibits around every corner. They’ll even get to touch sharks including a new species of shark never before featured at Newport Aquarium. Plus, Sundays through Fridays, one kid (ages 2-12) gets in free after 4 p.m. with the purchase of a full-priced adult ticket. This offer is available for a very limited time only from May 27 to July 8 and must be purchased online at https://www.newportaquarium.com/Visitor-Tips/Aquarium-Events/Summer-Family-Hours. Newport Aquarium is excited to announce the arrival of a new species of shark that is swimming its way into Shark Central. Wasabi and Sake, two baby Japanese Bullhead Sharks just joined more than a dozen other sharks in the Shark Central touch tank. Guests can easily spot the sharks as they make sand angels in the bottom of their tank, and by their long fins as they swim alongside the bigger sharks. They join the rest of their kelp forest “cousins,” including the Port Jackson, Leopard Shark, Leopard Catshark and Striped Catshark species. The aquarium is welcoming the new residents during Shark Summer from May 27 to July 8. Just in time for summer, Newport Aquarium is extending its summer hours and will be open from 9 a.m. to 7 p.m. daily between May 27 and September 2. Guests can touch more than a dozen different sharks in Shark Central. For a limited time only, guests will get two extra months free when they purchase an Annual Pass. That’s 14 months of fun and discovery for the price of 12 months, plus exclusive Passholder events, bring a friend free days and additional savings throughout the year. With extra time and free kid’s admission, guests have the opportunity to visit Newport Aquarium for Shark Summer, which runs May 27 to July 8. See sharks like never before when you cross over the open waters of the 385,000-gallon Surrounded by Sharks exhibit on Shark Bridge. Experience what it feels like to touch six different species in Shark Central. Then, get nose-to-nose with sharks when they swim next to you and above you as you venture through more than 80 feet of acrylic tunnels. Explore the tunnels, and be Surrounded by Sharks! Shark Nursery – See shark eggs from three different species of sharks. Guests will have the opportunity to see the early stages of life as a baby shark grows in the egg. This brand new shark nursery is in the Shore Gallery. Shark Bridge – More than 2 million thrill-seekers have dared to cross Shark Bridge! Included with admission, Shark Bridge is a 75-foot-long rope bridge suspended just inches above nearly two dozen sharks. More than 2-million thrill-seekers have dared to cross Shark Bridge. Shark Talks and Dive Shows – Guests catch their first and largest views of shark rays and sharks in Shark Ray Bay Theater. Divers take questions from the audience about the biology and conservation of sharks and other animals found inside the huge habitat. Shark Tank Feed – Guests can watch biologists feed the sharks and shark rays from either the Shark Ray Bay Theater, Surrounded by Sharks tunnels or through a biologist’s point-of-view from the Shark Tank Overlook. Touch Sharks – Inside Shark Central, guests have the opportunity to touch more than a dozen sharks including the brand new Japanese Bullhead Sharks. An Animal Experience Specialist teaches guests the proper technique to touch sharks and helps them understand each species in this international collection. 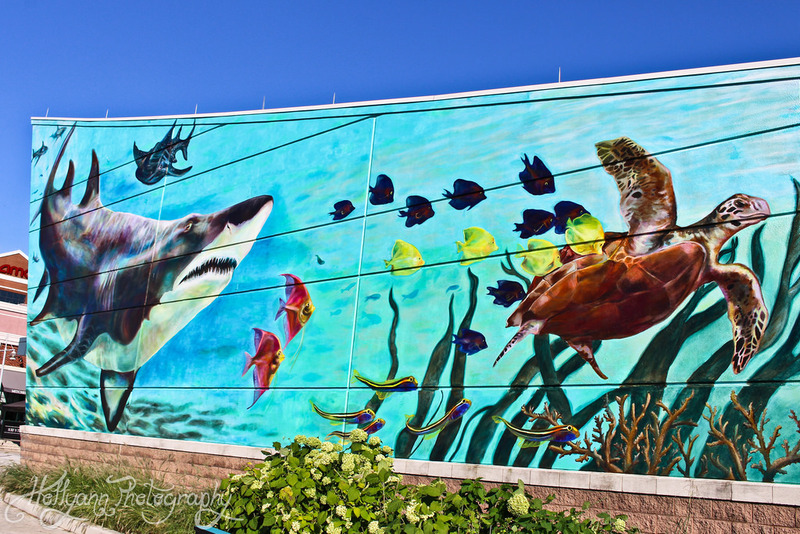 Newport Aquarium is the Shark Capital of the Midwest and with so many shark habitats to SEA, TOUCH and EXPLORE, it’s the best place to celebrate Discovery Channel’s Shark Week. See sharks like never before when you cross over the open waters of the 385,000-gallon Surrounded by Sharks exhibit on Shark Bridge. Experience what it feels like to touch six different species in Shark Central. Then, get nose-to-nose with sharks when they swim next to you and above you as you venture through more than 80 feet of acrylic tunnels. Visit July 23 through July 30 to see nearly 50 sharks up-close, including sand tigers, zebra sharks, black tips, nurse shark, shark rays and more! Newport Aquarium currently features more than a dozen species of sharks from oceans around the world. Shark Talks and Dive Shows – Guests catch their first and largest views of shark rays and sharks in Shark Ray Bay Theater. Divers take questions from the audience about the biology and conservation of sharks and other animals found inside the tank. One of the shark rays swims by during a Dive Show. Shark Tank Feed – Guests can watch biologists feed the sharks and shark rays from either the Shark Ray Bay Theater, the Surrounded by Sharks tunnels, or through a biologist’s point-of-view from the Shark Tank Overlook. Touch Sharks – Inside Shark Central, guests have the opportunity to touch dozens of sharks. An Animal Experience Specialist teaches guests the proper technique to touch sharks and helps them understand each species in this international collection. The Port Jackson shark has a unique color pattern with dark, harness-like markings that cover the eyes, back and sides. Leopard sharks can reach up to 7-feet long. Summer Family Hours – Get free kid’s admission during Summer Family Hours. Sundays through Fridays, one kid (ages 2-12) gets in free after 4 p.m. with the purchase of one full-priced adult ticket. This offer is available until September 1, 2017 online only: https://www.newportaquarium.com/Visitor-Tips/Aquarium-Events/Summer-Family-Hours. NEWPORT, Ky. — Newport Aquarium is kicking off Memorial Day weekend with free kid’s admission during Summer Family Hours. Sundays through Fridays, one kid (age 2-12) gets in free after 4 p.m. with the purchase of one full-priced adult ticket. This offer is available between May 28 and September 1 online only: https://www.newportaquarium.com/Visitor-Tips/Aquarium-Events/Summer-Family-Hours. Just in time for summer, Newport Aquarium is also extending its summer hours and will be open from 9 a.m. to 7 p.m. daily between May 27 and September 2. With extra time and free kid’s admission, guests have the opportunity to visit Newport Aquarium’s newest attraction, Stingray Hideaway, as well as cross the recently celebrated Shark Bridge. For a limited time only, guests will get two extra months free when they purchase an Annual Pass. That’s 14 months of fun and discovery for the price of 12 months, plus exclusive passholder events, bring a friend free days, and additional savings throughout the year. Newport Aquarium’s newest attraction is open and ready to make a splash this summer. Stingray Hideaway: Enter their World includes a 17,000-gallon stingray touchpool and a 30-foot tunnel for guests of all ages to enjoy an interactive experience unlike any other in North America. These animals are majestic and they do need to be protected in the wild. Guests of all sizes can interact with stingrays at the tank’s different height levels. A smaller touch tank of epaulette sharks provides a touch experience for even the smallest guests. The 30-foot tunnel lets guests experience the stingrays from below, and the pop-up area allows them to enter their world with a 360-degree view. Newport Aquarium, named one of the top 10 U.S. aquariums in in 2017 by USA Today’s 10Best.com, one of the top U.S. aquariums in 2016 by Leisure Group Travel, and has showcased thousands of animals from around the world in a million gallons of water since 1999. Named a top U.S. aquarium by US City Traveler and Destinations Travel Magazine in 2014, and also by Travel Channel in 2013, Newport Aquarium is a Herschend Family Entertainment company and an accredited member of the Association of Zoos and Aquariums. Newport Aquarium is open to the public 365 days a year and is located across the Ohio River from downtown Cincinnati at Newport on the Levee. The rare shark rays born earlier this year made their official public debut today in the Coral Reef. This is the first time the public has gotten the chance to see them. The 60,000 gallon Coral Reef habitat is similar to their native surroundings in the Indo-Pacific. Shark ray pups explore the Coral Reef. The 60,000 gallon Coral Reef habitat is similar to their native surroundings in the Indo-Pacific. Newport Aquarium is proud of the work of the team of biologists taking care of the pups since they were born in January. Part of the Animal Care Team: Mark Dvornak, Scott Brehob, Jen Hazeres, and Jolene Hanna – standing in front of the top of the Coral Reef tank after moving the shark ray pups into the tank. The pups have reached several milestones since birth. The pups range in weight from 10 to 13 pounds and they’re around 2.5 feet long. At birth, the pups’ weight ranged from 2 to 2.4 pounds and 18 to 22 inches long. Shark ray pup swimming with Dory – exploring the surroundings in the Coral Reef. Hazeres and Hanna are part of the Animal Care Team that closely monitors the pups and attends to every need. This has been a long journey for the biologists and they continue to learn from the pups and each other every day. “They’re intelligent animals – they’re very aware of you and their surroundings,” said Hanna. Shark rays are an amazing species with unique characteristics. The Coral Reef habitat gives Newport Aquarium guests an opportunity to get eye to eye with the shark ray pups. Get eye-to-eye with the shark ray pups as they swim overhead in the Coral Reef tunnel. “We’re still learning about this species – so little is known about them in the wild. By having them here, under professional care, we’re learning their growth rate and so much more,” said biologist Scott Brehob. With the debut of shark ray pups in the Coral Reef, Newport Aquarium is happy to kickoff the Summer Family Hours Special. 2 Kids Get In Free! Families can make a splash this summer with Newport Aquarium’s Summer Family Hours Special – for tickets purchased online only. Now through September 2nd, up to two kids get in for free after 4 p.m. with each adult paying full price Sunday through Friday from 4:00 p.m. – 7:00 p.m. Purchase tickets at www.newportaquarium.com. NEWPORT, Ky. — Newport Aquarium is making a splash this summer with the return of its Summer Family Hours promotion, when up to two children (ages 2-12) receive FREE* admission between 4-7 p.m. with the purchase of one full-priced adult ticket. This family-favorite offer is available for purchase online only, at newportaquarium.com, for visits now through Aug. 31, Sundays through Fridays. Guests will have even more opportunities to enjoy a million gallons of fun as Newport Aquarium has extended its operating hours from 9 a.m. to 7 p.m. now through Aug. 31. With the earlier opening time, the daily Penguin Parade will begin at 9:15 a.m. during this period. Dare to Cross the all-new Shark Bridge at Newport Aquarium. Newport Aquarium dares guests to cross the world’s first and only Shark Bridge, a 75-foot-long rope bridge that hangs just inches above nearly two dozen sharks. Shark Bridge provides guests extraordinary views of the Surrounded by Sharks exhibit’s 385,000-gallon tank, which features seven species of shark, including Newport Aquarium’s newest addition – extremely rare scalloped hammerhead sharks! Newport Aquarium guests can get eye to eye with adorable Asian small-clawed otters, exotic yellow tree monitors and panther chameleon lizards, as well as Thunder the 100-year-old alligator snapping turtle at the all-new Canyon Falls exhibit.